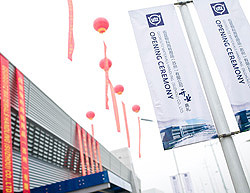 The Utz Group with new production plant in China | George Utz Ltd. 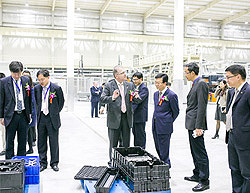 Within the framework of a large party on 18 May 2015, the Utz Group, manufacturers of plastic load carriers, celebrated the opening of its seventh company-owned production plant in Suzhou, China, a metropolis with a population of 8 million in the Jiangsu Province near Shanghai. More than 250 guests arrived at the festive event. To emphasise the significance of this investment both for the globally acting corporate group and for the regional economy, the Vice-Major, who is also the Chairman of the significant industrial region Suzhou New District (SND), gave the opening speech. The decision to invest in a new company within the Utz Group in China had been felled approximately two years ago and was also put into prompt action with the purchase of a suitable property in Suzhou in accordance with a tight schedule. This not only encompassed the construction of production and office buildings. The plant was equipped all the way to production maturity. Injection-moulding machines with a locking power of up to 2,700 tonnes were procured and vacuum forming production was moved from the current location. In China, Utz is able to manufacture component holders to pallet size. In order to commence with production for customers from the automotive, pharmaceutical or electronic industry immediately after opening, moulds and tools for machinery also had to be manufactured at the same time. That processes and technologies comply with the European standard of quality has now been ensured by the certification of the Chinese subsidiary in accordance with ISO 9001. Utz customers, having already had good experience with the company in Europe, also expect the same service and quality for Utz products from the Chinese subsidiary. Utz Suzhou is therefore fully integrated in the international company network of the family enterprise. The local team is supported by employees from European Utz subsidiaries. This ensures that internal quality standards are maintained. Exactly on the planned opening day, all work was complete and the plant smartened up for the numerous guests. The celebrations were not only joined by honoured guests from the regional party elite and local politicians. The Utz Board of Directors, shareholders, CEO and general managers from Europe and the USA also wanted to congratulate the Chinese employees on site. CEO Axel Ritzberger summarised the long planned, great opening day: "We managed to set up a highly modern plant here in China without any delay, one which fulfils all European standards. This is thanks to the uncompromising quality demand which also applies to our plant in Suzhou. 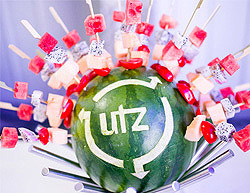 We only offer our customers and partners the usual Utz quality. It is surely a good omen for the future, that our guests were not only satisfied but also very impressed about the high level at which Utz has positioned itself here on the Chinese market. We look forward to the future success of the youngest member of the Utz family of enterprises."